White supremacist violence in Charlottesville, Va., over the weekend highlighted the need for swift removal of Confederate monuments from public lands — even though this effort is far from new. New Orleans has already removed Confederate memorials, and cities like St. Louis, Mo., Rockville, Md., Orlando, Fla., and Gainesville, Fla., have relocated their monuments. These victories are a result of hardworking activists and sustained public pressure, but public support dramatically increased after Charlottesville. On Wednesday, Hollywood Forever Cemetery removed a Confederate monument after outcry. Meanwhile, Baltimore quietly stripped city parks of similar monuments overnight. In Helena, Mont., the city commission voted to take down their Confederate memorial. And in Durham, N.C., activists got tired of waiting and took care of the job themselves. While Confederate monuments are often touted as “historical,” many in fact only date to the mid-20th century — and sometimes even later. Some claim that removing these memorials is an attempt to erase or hide history. However, relocating monuments to racism to areas where their context can be better explored and explained — like museums — offers an opportunity to discuss past events and to learn in an environment that also offers resources highlighting the horrors of slavery. This is not a history that will be forgotten. We didn’t list every single Confederate monument in the U.S., but here’s a start. If your city is listed, take the time to contact a city council member for a serious discussion about what needs to happen for the monument to be removed — and start a petition to back up your action. And even if you don’t see your hometown, consider taking a stroll around your historic downtown or a local cemetery. You might be surprised by what you find. For a full list of public Confederate symbol, check out the Southern Poverty Law Center. Be aware that some states have enacted legislation specifically barring removal of monuments, depending on the monument and the circumstances. North Carolina, Alabama, Virginia and Mississippi all have laws that make it difficult or impossible to remove monuments. In other states, the red tape can be considerable. While you push to remove monuments, consider contacting your state lawmakers about repealing laws that impede the course of progress. Noted traitor Robert E. Lee is a popular feature figure on Confederate statutes, thanks to his high profile in the Civil War. Charlottesville hosts one among at least six Robert E. Lee statues, and he’s also commemorated in highways, school names and more. Charlottesville’s City Council had opted to remove the statue and rename Robert E. Lee Park to Emancipation Park, but their plan met with unexpected resistance when white supremacists hosted a rally to “defend” the statue. The demonstration turned fatal when a terrorist drove a car into a crowd of counterprotesters, killing one and injuring others. In case you’re wondering about the historical value of such statutes, Robert E. Lee’s great-great grandson, the person with the biggest historical claim on Lee’s legacy, is fine with relocating statutes like this one to museums. Care2 activists are calling for the Lee statute to be replaced with one of Heather Heyer, the slain activist. Erected in 1920, this statute commemorates a Confederate soldier with a long military career. Loring originally served with the U.S. Army before switching sides in the Civil War, and he briefly called St. Augustine home during his youth. There’s another Confederate monument nearby, erected in 1872, also worthy of relocation to a museum. Care2 activists have targeted the Loring statue. Join them! Chicago’s Hyde Park houses a lovely cemetery with a number of beautiful monuments. It also includes a plinth and statue commemorating Confederate soldiers who died while imprisoned at Camp Douglas during the war. The monument, dedicated in 1895, is decorated with plaques depicting idealized versions of Confederate soldiers and their lives. It’s accompanied by decorative cannons, a sculpture of cannonballs and a list naming the soldiers believed to be buried under it. Louisiana hosts a large number of Confederate monuments, but this one is on the grounds of a courthouse, giving it special significance. Commemorating people who fought and lost in a war with an unjust cause seems like poor form for public statuary around a court of law, doesn’t it? Care2 activists certainly think so: They’re calling for the monument’s removal. Arizona played home to racists fleeing the South in the 1860s, including veterans who left the region at the end of the war. Consequently, the state actually has a lively culture of Confederate monuments like this one, which was dedicated in 1999. It’s not the most recent Arizona monument, either. That honor belongs to the Confederate Memorial in the Arizona Veterans Cemetery in Sierra Vista, dedicated in 2010. Built in 1961, this is another Confederate memorial of recent vintage — notably, Arizona flew the Confederate flag over the Capitol in this same year to commemorate the 100th anniversary of the Civil War. One activist has already gotten a head start on this one: She added some signage to turn it into a “second place participant” trophy, referencing the fact that the Confederates lost the war. Care2 activists are demanding that this statue be relocated to a museum. Join them! Don’t confuse this Charleston with South Carolina’s Charleston, made infamous in Charleston church shooting in 2015, when residents were reminded of the high costs of racist legacies. This statute has been targeted for removal before, with little success; despite outcry, the statue remains. Could this be the nail in Stonewall’s coffin, though? Richmond, former capitol of the Confederacy, is littered with Civil War history and Confederate memorials, including a string of statutes on Monument Avenue featuring Robert E. Lee, Stonewall Jackson, Jefferson Davis and more. The city’s mayor, elected in 2016, has made it clear that he wants to see the statues go. In 2015, this monument was the target of some editing when activists added “Black Lives Matter,” but sadly the city didn’t take the graffiti to heart. Instead, the statute stands tall and has thus far resisted calls for removal. Mount Rushmore and its depiction of former presidents may be famous, but it’s not the only rock face that has been repurposed for a display of historical figures. 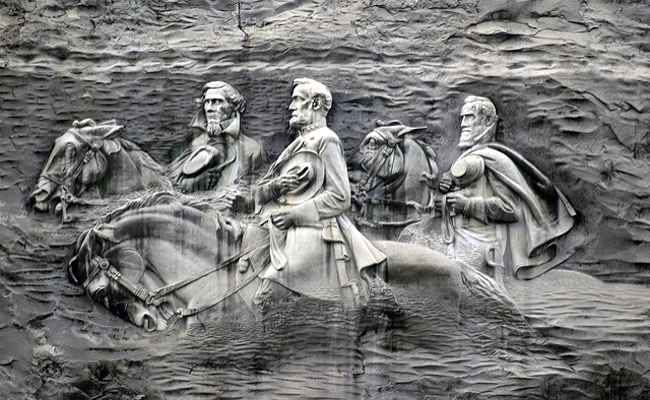 In Stone Mountain, a massive bas relief that spans nearly two acres depicts Jefferson Davis, Robert E. Lee, and Stonewall Jackson. The carving is used for light shows and community events, despite the fact that the figures depicted have no roots in Georgia history. Care2 activists are calling for alteration or removal of the carving. Join them! Sign this Care2 petition and urge Durham Country Sheriff Mike Andrews to drop the charges against protestors who toppled a Confederate statue. Is there a Confederate monument in your town? How about a street or school named for someone from the Confederacy? Start a petition to say it’s time to make sure history stays where it belong: In museums, not on public land! And don’t forget to share your petition on social media and tag #TakeThemDown. Each and every one of these monuments should stay right where they are! What we should do instead is erect monuments to show the other sides of things. What about Harriet Tubman, Rosa Parks, Frederick Douglas, etc. Take them down and put them in a museum instead. Take them down and put them n a museum instead. I disagree. We can put up monuments for what we believe in mow, but why remove the old ones. It is a part of history. I'm not sure I see the value in getting rid of the monuments, I think a reminder of history will be lost. People tend to forget how history is written and by who. I think a plague beside each of the monuments explaining the truth would be a better teacher. In my home town Winnipeg, we learned that Louis Riel was a traitor when I was a kid in school, and he was hung but now we know why he was considered a traitor and by whom. Distorted histories written by the winners is quite common, but the lesson remains the same, removal might just fill the need of the angry ones who see the injustice, but not sure it's the answer. I agree, why have monuments of the evil people that did not good, specialy the ones that are racists and killed so many because they want to continue to slave innocent people.